The forest has filled in beautifully. 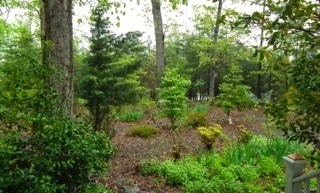 From the lime green beginnings of leaves to a deep lush green forest in only two weeks. Everything looks fresh and new. 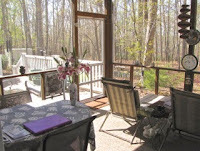 The screened porch is my domain when the weather is right. I love fresh air and the sound of the leaves clapping their hands as they praise the Lord with me. 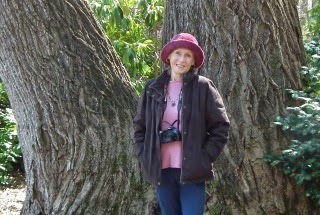 The sounds of the birds, bugs and critters is music to my ears. Oh, how I would love to live in a tree house with indoor plumbing. I am just in awe of all that God created for us to enjoy. He is a good Daddy. Having a close relationship with this Papa is certainly a never-ending dream. My earthly Daddy was my grandfather and he loved me so much and I always knew that. We spent a lot of time together when I got older taking trips. He loved to travel and my Mom (grandmother) never did. God obviously tops my grandfather's love for me and I wonder if we'll ever have the capacity to fully understand that love within our hearts and spirits. Tidbit - Velcro - Burdock root is one of those “weed” herbs that Americans are usually trying to eradicate. A member of the Composite or Asteraceae family, it is related to artichokes and thistles. It’s known for its distinctive prickly burs that like to hitchhike on animals and people alike. However, something good came out of them, in the 1940’s, when the burrs, or seeds, were looked at under a microscope. The hook-and-loop system of the seeds led to the invention of Velcro. We may think of burdock as a weed, but in Japan, it’s a food, called gobo. In fact, throughout Asia, the taproot of young burdock plants are eaten as a root vegetable. It was also used as a food by Native Americans. 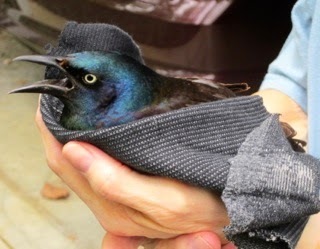 Birds - Another Grackle Rescue - This precious one hit the deck glass door and fell into a pot beneath it, legs up. Wings were spread out so was concerned about them being broken. Picked it up and the head was held so no broken neck. I checked the wings and both were fine, so I folded them back into its body. Got a rag to surround it with some warmth although it was 62, but it was in obvious shock with mouth held open the entire time. After it "sat for" its glamour shots, it flew out of my hand into a tree. Definitely no wing problems. Yay! So awesome to see them survive. Our deck door is covered with decals and a patterned long topper so the birds can see the variation. For some reason they still hit the deck door. I've noticed several times it is when a hawk is nearby so I guess they go senseless when being chased by a hawk. That's why I always run when I hear the thud. If there's a hawk nearby it won't be mealtime with this one. Grackles are not always a favored bird. I might say that it generally isn't. It's a large bird at about 12 inches long and the coloring is iridescent black. So pretty! You can see has a long dark beak and those yellow eyes that were flickering while in the bird was in the plant pot. The northern birds migrate in flocks to the SE U.S. in winter and that would include us here in Central Virginia. You can hear their loud and harsh song as they're flying across the skies and landing in trees. View Video of Our Noisy Flock. These birds are omnivorous, eating berries, seeds, and grain and also insects, small birds and eggs, plus frogs and small fish. Guess you can see why they're not well-favored. Here they consume the suet, sunflower seeds and cracked corn. With grains being in their list of favorites, farmers are certainly not happy with the presence of this Common Grackle (Quiscalus quiscula). Cooper's Hawk - Hawks are such beautiful creatures, but they sure don't earn any points with me on their appetite for birds ... especially when it's "MY" birds. They cause a lot of excitement when they enter the backyard with all things scurrying for cover. This Cooper's Hawk landed on a branch only 6' from the deck which contains a birdbath and a sunflower seed feeder. Cooper's Hawk populations, especially in the East, declined significantly in the middle of the 20th Century, due to shooting, trapping, and pesticide contamination. They are still listed as endangered or threatened in several eastern states, but most populations have recovered well. 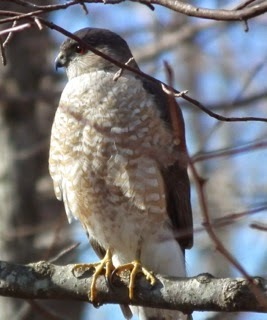 They hunt for medium-sized birds (robins and jays) and small mammals (squirrels and mice) which make up the majority of the Cooper's Hawk's diet. They're generally found in forested areas up to 3,000 feet, especially near edges and rivers preferring hardwoods available, but they will use conifers also. 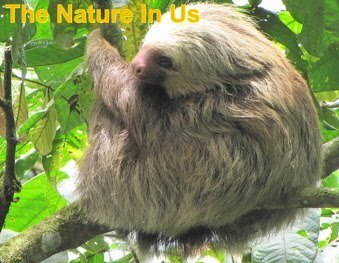 The species prefers mature forests, but can be found in urban and suburban areas where there are tall trees for nesting. During the nesting season, Cooper's Hawks are often more common in open areas. Courtship is long for Cooper's Hawks with the male feeding the female for up to a month till she begins to lay 3-5 eggs that incubate about 30 days. They build their nest in a tree 25-50 feet from the ground and often built on top of an old nest. Both sexes build the nest from sticks and lined with bark pieces. The male incubates the eggs when the female leaves to eat. I guess he's ready for a rest after a month of hunting for two. Once the eggs hatch, the female stays with the young 'uns for about 2 weeks. During this time the male again brings food for both the female and the young giving it all to the female to feed the nestlings who begin to climb around the nest at 4 weeks of age. They will begin to make short flights soon after this, but the parents continue to feed the young up to 7 weeks. Wild Critters - Kermit the Frog - A new species of glass frog that bears a striking resemblance to Kermit the Frog has been discovered in Costa Rica. It was discovered in the Talamanca mountains and is the first new species of glass frog to be discovered in Costa Rica in over 40 years. No word yet if there is a Miss Piggy look-alike pig also residing in the same jungle [grin]. Check out the new frog. Dolphin Asks People for Help - On a night-time dive near Hawaii, 2 divers were found by a bottle-nose dolphin and it started to swim around them over and over again. 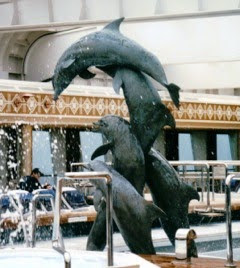 When looking closer, one of them discovered the reason for this strange behavior - the dolphin had a fishing line hooked around it, from its fin to its mouth, hindering its ability to swim. They cut him free, and the dolphin swam away. The fact that a dolphin would come to humans for help may be evidence of its intelligence, as most injured animals would never come close to a human. This is amazing to watch and a life-time experience for those two divers. Watch the Video. Tidbit - Graffiti in National Parks - Andre Saraiva is an internationally known graffiti artist. He owns nightclubs in Paris and New York and works as a top editor of the men's fashion magazine L'Officiel Hommes. Two months ago he showed up on the decidedly un-fashionista website Modern Hiker, along with a photo of a boulder he tagged in Joshua Tree National Park. Big difference since we actually go with our heart (feelings) rather than our intellectual prowess. Unless we keep a tight reign on our emotions, we'll always make decisions based on heart beliefs since that's where our beliefs about who we are have been stored since birth. When receiving is about Jesus, you are receiving the promise of God from your position in Christ, which means that spiritually your need is already met to the place that you are identifying with the promise, not the problem. When you identify with abundance then you automatically disown lack and see it as temporary, not a continual problem, because you see yourself as blessed, not trying to get blessed. Any time you are trying to get something that you already have, you do not believe that you have it. If you cannot get your thoughts off your problems then you are listening to your own voice because deep within your heart you are believing in the problem. If through any one of your five senses the problem is communicating to you to the place that the problem becomes more real than the promise in God’s Word, then you are looking at the problem in your life instead of looking unto Jesus who is the author and finisher of your faith. The answer is never found looking at the problem where you are trying to fix the problem like an unbeliever would. No, in the process of believing, you want to involve the Holy Spirit and not rely on yourself in self-effort. The receiving of the supply is a good thing causing us to rejoice, but that is not when our need is met. This is the way it works in the world. No, our need is met in Christ now and we bring receiving the manifestation into the natural realm by our believing that the promise is ours now. When the promise in God’s Word becomes more real to your heart than the problem in your life, your heart is open to receive from God. This is when you are more sensitive to the voice of the Holy Spirit than your own voice." Visit Cecil & Lisa Paxton's website. Vaccines - There's a lot of emphasis and news these days on vaccines. 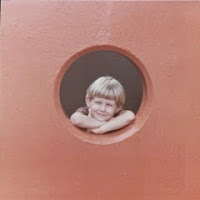 Certainly more talk about vaccines since I birthed my child in 1979. At that time information wasn't as easily accessed as it is today ... but the information was valid even then. Because of that we decided against vaccinations for our son and never had a regret on it. Since that time governments have set up funds for deaths and injuries from vaccines. In case you think children can't go to school unless they're vaccinated ... do your research. No Shots No School isn't the whole truth. The key here is to talk with our Lord on topics such as this. As a Christian we are promised protection if we "dwell in the secret place of the Most High God." "For everything in the world - the lust of the flesh, the lust of the eyes, and the pride of life - comes not from the Father but from the world" (1John 2:16). These are the ways the devil deceives us as he did Adam & Eve and even Jesus at the end of His season in the wilderness ... But! Jesus gave us a way back in because He didn't sin as Adam did ... and when we place His Truth in our hearts through faith it brings all of His promises forth in our lives. How awesome is our loving God toward us. We need to redeem our time to know Him and worship Him. All of our earthly tasks don't compare to knowing Him, which can make our earthly life peaceful and full of joy in any circumstance. "What is man, that thou art mindful of him?" (Psalm 8:4). Worship - We attended a spiritual meeting and enjoyed the worship band so much. 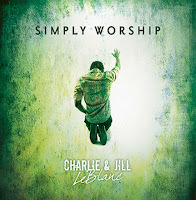 Charlie & Jill LeBlanc sing with such peace in their music that you can feel it. I wanted a CD that was all worship songs and they had one called Simply Worship. You can even download the lyrics to it. It's not the rev up loud kind of music so prevalent today ... not that it's bad, it's just not my type of music. I want to be in a peaceful mode when I worship ... with the songs being slow enough to easily memorize the lyrics and transmitting God's peace with every note. If you're the same way, I think you'll enjoy this CD. You can listen to a "smidget" of each song on the album. I actually ordered the download because I wanted it on my Walkman. My favorite song, Come Unto Me can turn me into a puddle of liquid love in a minute. It's just awesome. Check out the album. I love it when everything turns to green again! View from front door 5-1-15. Wish you could sit with me on the porch. Still Celebrating - I can't get my mind off the beauty around me. Heaven must be eternal Springtime! It's such a gorgeous time of year. Mid-November until mid-April is like a dearth of foliage here, although we have plenty of evergreens around. The look of bare hardwoods in the forest behind our house and lack of blooms in the garden areas without bees and butterflies everywhere isn't as soulfully satisfying as mid-April to mid-November. So when it all fills back in I'm a very happy camper. Oh, how I love to sit and just watch it all grow and begin to bloom. It also makes me think of how nice it would be to sit with many of you and share the joy of God's Creation.